Howard Hodgkin was born in London on August 6th 1932. From 1949–54 Hodgkin studied at the Camberwell School of Art and Bath Academy of Art. Hodgkin later went on to teach at Chelsea School of Art between 1966–72. An accepted member of the British art establishment Hodgkin represented British art in several ways. From 1970–76 Hodgkin was trustee of the Tate Gallery and was made trustee of the National Gallery in 1978, a position Hodgkin held until 1985. Hodgkin also represented Britain at the XLI Venice Biennale in 1984. Hodgkin went on to win the second Turner prize in 1985 with his painting entitled 'A Small Thing but My Own'. 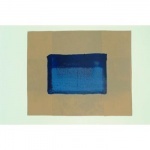 In addition to having been awarded a CBE in 1977 Howard Hodgkin was knighted in 1992. In 1997 Howard Hodgkin won Shakespeare Prize. 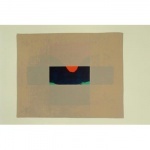 In 1999 Hodgkin was made an Honorary Fellow of the London Institute and in the following year Hodgkin was made Honorary Doctorate of Letters of Brasenose College, Oxford University where he spent the academic year 1976-7 as Fellow in Creative Art.